Help Us Name Our New Giraffe! 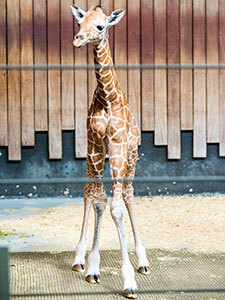 Our newest and tallest addition, a female giraffe was born April 26 to mother, Marlee, and father, Bahatika. The youngster is doing well, nursing from mom, and spending time acclimating to the other giraffes and her new surroundings. But, she needs a name, and we’d like the public to help us choose a favorite! Following are several giraffe names from which to choose. Anyone is eligible to cast a vote; and we ask that you please only vote once. Voting begins May 18 and will remain open until 11:59 p.m. on May 24. The votes will be tabulated, and the winning name will be announced May 26 at 10 a.m. on her one-month birthday! Thank you to everyone who voted on a name for our giraffe calf. We will announce the winning name Thursday, May 26 at 10 a.m.